Hospice of Southern West Virginia offers support not only to our patients, but their caregivers as well. We offer grief support to family members after a loved one has passed away. If you know someone who needs our support, please call us at 304-255-6404. Hospice of Southern West Virginia not only provides care and support for our patients, but for their families and caregivers as well. Home Health Aides help with bathing, dressing and daily activities and make sure caregivers know how to perform these tasks in their absence. Respite care at Bowers Hospice House gives caregivers the brief break needed to recharge from providing 24/7 care to their loved one. It is also a time for caregivers to take care of their own personal or medical issues. Medicare provides a maximum of 5 consecutive days at Bowers Hospice House. Patients are allowed multiple respite stays during their Hospice care (usually not more than once per month). It is never too early to start planning for your future healthcare needs. Decisions are best made when you can take the time to discuss your options with your doctor, family and loved ones. The process includes putting your wishes in a written document called an advance directive. Living Will - A statement indicating what kind of medical treatments you do and do not want to receive. Medical Power of Attorney (MPOA) - A written statement designating another person to make medical decisions for you if you are unable to make them for yourself. Discuss your wishes with doctor, family and loved ones well in advance. Make sure your advance directives are up-to-date and revisit them frequently. Consider looking into memorial or funeral planning as well. These may be hard topics to discuss but planning ahead can relieve anxiety and confusion for your loved ones. Grief is a normal response after the loss of a loved one. It's important to realize that everyone grieves differently. Some people may get over a loved one's death rather quickly, while it could take years for another. Both responses are normal. Remember, there is no right or wrong way to grieve. Our bereavement specialists understand this and are here to guide you through the grieving process. All bereavement services are free and available to everyone in the community, even if their lost loved one did not receive services from HSWV. If you have questions or would like more information, please contact the Bereavement Department at 304-255-6404. Monthly letters – HSWV has a mailing list available for any bereaved person who is interested in receiving a monthly letter addressing various grief related topics for 13 months following their loss. Phone calls – HSWV offers telephone support from our Bereavement Staff. Individuals are assessed and may receive monthly, quarterly, or bi-annual telephone calls from a bereavement professional for one year following their loss. Community Memorial Services – Each fall, HSWV hosts a memorial service in Raleigh, Fayette, Summers and Wyoming Counties. Invitations are sent to families who have lost loved ones who received services from HSWV in the past year. These memorial services are also advertised in the local newspaper and anyone from the general public is welcome to attend. Coping with the Holidays – This is a three-week, special topic support group for adults addressing specific grief-related issues that arise during the holiday season. Camp Hope – A bereavement day camp for children ages 7-17 who are coping with the loss of a significant person, where children learn coping skills for grief related experiences and will also have opportunities for lots of fun! Bereavement Support Groups for adults ages 18 and older are held in various locations throughout the year. These groups are free and are open not only to families who have had loved ones receive care from Hospice of Southern West Virginia, but are also available to anyone in the community who has lost a loved one through death. Sometimes dates and/or locations of these groups are subject to change, and changes may be made in the case of inclement weather. Please call our Bereavement Department at 304-255-6404 in advance to confirm the date, time and location of the group you are interested in attending. 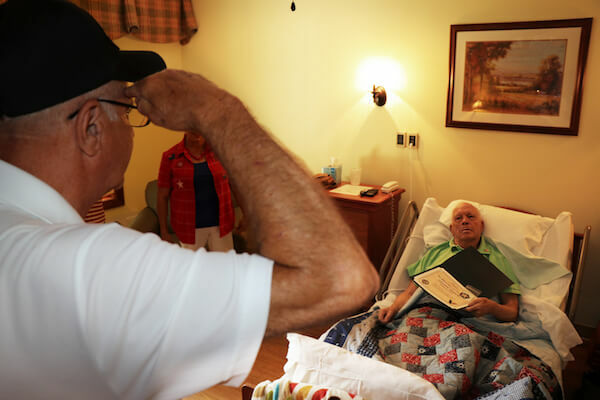 The emotional and spiritual components of hospice care can be especially meaningful to veterans who often face issues near the end of life relating to their military experiences. Support is even more crucial for veterans who do not have a strong support network of family or friends. We Honor Veterans, a project of the National Hospice and Palliative Care Organization (NHPCO) in collaboration with the Department of Veterans Affairs (VA) has invited hospices, state hospice organizations and VA partners to join a pioneering program focused on respectful inquiry, compassionate listening and grateful acknowledgment. By recognizing their unique needs, community providers like Hospice of Southern West Virginia, in partnership with the VA, help guide America's veterans and their families through their life stories toward a more peaceful ending. More than 1,800 veterans die every day. This represents a quarter of all deaths in America. Approximately 85% of veterans do not receive care through the VA health care system. Most veterans still die in the community; only 4% of veteran deaths occur in VA facilities.